Concussions and obvious brain injuries sustained on the football field may only be the tip of the iceberg. New research suggests that ANY exposure to tackle football before the age of 12 puts a child at increased risk of behavioral problems and depression later in life. These findings by researchers at Boston University have just published their findings in Nature’s journal Translational Psychiatry. In the more than 200 athletes in this long-term study, all of whom had played football before the age of 12, it was found that compared to a normal population the rate of behavioral problems was doubled, and the rate of depression was tripled. Some study participants had stopped playing football by high school and others had gone on to play in college and the NFL. An earlier study by Stern had shown diminished mental flexibility that among NFL retirees who started playing before they were 12, compared to those who started playing later in life. 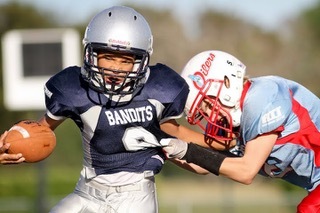 Last year, results of MRI studies of boys between 8 and 13 who had only played one season of tackle football were published by researchers at the Wake Forest School of Medicine. The study showed diminished function in some areas of these children’s’ brains. When a child’s head is struck, jostled, or suddenly twisted, the forces on brain tissue cannot be diminished or controlled by headgear. Protection is a myth. Avoidance is the only reasonable path to prevention of brain injury in children when considering participation in contact sports.